Memory Visco Pillow Body Temperature Sensitive. All the benefits of the original Royal pillow, now moulded in the very latest Visco Memory material. 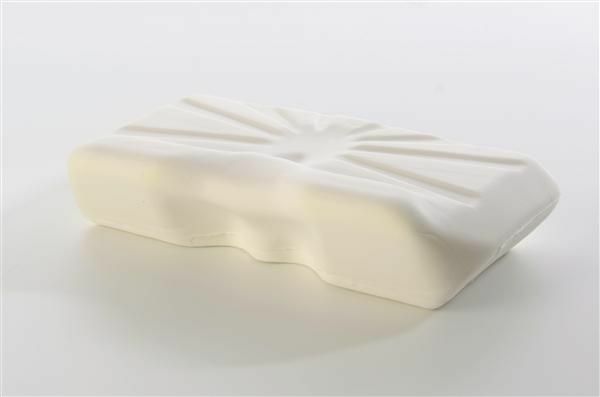 Sensitive to body temperature with a gel-like feel, this new pillow gives even pressure distribution while it supports and moulds to the individuals shape. The pillow constantly re-adjusts to ensure weight is distributed evenly. Visco memory foam was originally developed for the NASA astronauts. Our orthopaedic visco elastic memory foam pillow come complete with a carrier bag for when you want to take the pillow with you whilst travelling. There is nothing worse than uncomfortable hotel pillows! The Royal Visco Pillow is designed for those who sleep on a single pillow, the King size for those who prefer to sleep on two pillows. Lifestyle Consumer Magazine has awarded this pillow their Best Buy nomination for support pillows. It states that this Royal Visco Memory Pillow provided the best relief from neck pain. An amazing 87.5% of the panel felt it helped not only their neck pain, but also other problems such as disturbed sleep, headache and back pain. The Royal Pillow with Visco Memory measures: 520mm x 310m x 130mm (20½" x 12" x 5"). The King size version is larger / thicker than the 'Royal', for those who prefer to sleep on two pillows. The King Size Pillow measures 580mm x 335mm x 150mm (23" x 13" x 6"). Both come with a carrier bag so you can take it with you whilst travelling. The pillow comes with a cover which can be taken off and washed by hand in cold water. Very good quality pillow which eases the neck pain I suffer due to arthritis . Happy with my purchase.